Since the seventies one thing has been clear: the longer the hair the better the music. Our friends of Bandje Bandje are paying a tribute to earlocks and rock ‘n roll. Therefore, expect long-haired artists only, varying from deephouse to techno. On the bill: Applescal (live), Haarbaarbaar, La Vondèl (live), Flannels, Het Meisje, No Reset and more. Shoeless, you probably know it for being “the only party where you have to hand in not just your jacket, but also your shoes at the wardrobe”. This Saturday, they’ll be taking over the whole Magneet Festival area, to celebrate the summer on bare feet for the last time. Expect your much needed dose of cozy little market shops, foot massages, people dressing up and nice chill out areas. No line-up available yet, but I cannot imagine this taking place without artists like Arjuna Schiks and Olivier Weiter. Trouw is opening doors again this weekend! Time went fast this summer huh? On the Saturday a collaboration between Drukpers & Black Magic invite Todd Terje, Job Jobse in Trouw and J.G. Wilkes and Patrice Bäumel in De Verdieping. Todd Terje has become one of the biggest surprises in the electronica scene this past year. Specially after his recent disco/electronic masterpiece ‘Inspector Norse’, both as a song and as a video. I’m sure you’ve heard or seen it by now, but in case you haven’t, this will make your day! Lastly, on Sunday our friend Enrique is planning on creating a place for music lovers to have fun together and listen to quality music. He doesn’t think in genres but lets the music speak for itself. A diverse musical programme where his artists can tell a story. 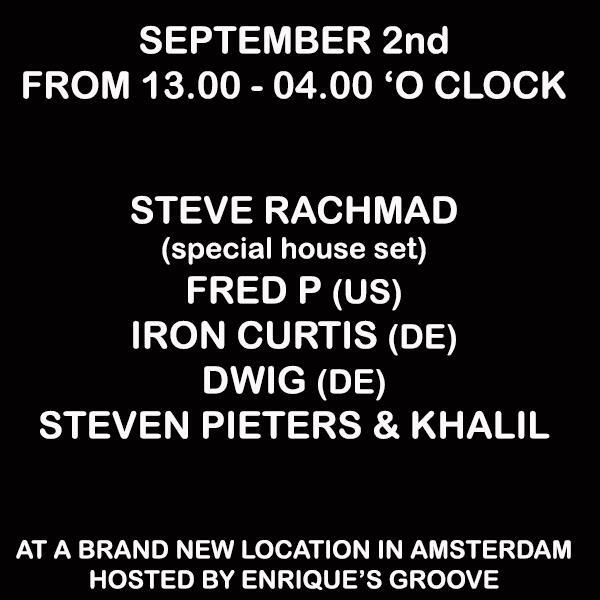 Oh yeah, and did I mention Amsterdam’s techno guru Steve Rachmad will be doing a special house and disco set? Support comes from Fred P aka Black Jazz Consortium (US), Iron Curtis (DE), DWIG (DE), Steven Pieters & Khalil and Enrique’s Groove himself. Have a very pleasant hangover Amsterdam!